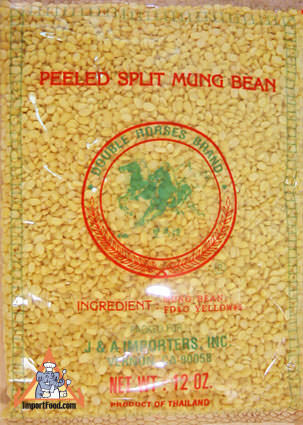 We've sold peeled split mungbean since 1999, when we first started ImportFood.com, and we've just recently discovered how much we love the flavor of this starchy, sweet dried bean. It's hard to describe the pleasant aroma of mungbean when it's being steamed. It cooks nicely and has a distinct dessert flavor. 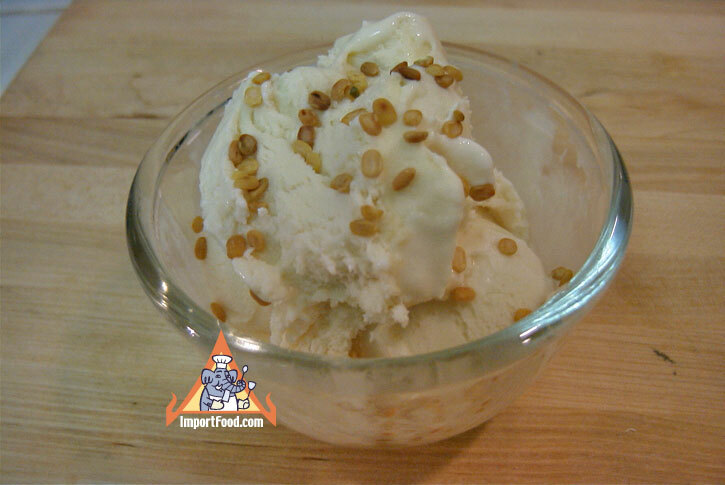 A creative chef of any style food can incorporate this into just about anything with excellent results, in particular desserts. It's also a unique, peculiar crunchy treat used as a topping for sticky rice or even ice cream, if you toast it slowly in a dry skillet over very low heat. We also offer delightfully sweet natural mungbean flour, whole green mungbean, and mungbean noodles. Met Khanoon is a very sweet, delicious dessert that was likely introduced to Thailand by Portuguese explorers. Typically made in a brass wok. The taste is heavenly. Met Khanoon means "seed of jackfruit" which is what it resembles. A tradition is to have met khanoon at Thai weddings. Met Khanoon symbolizes that whatever bride and groom do in life, they will have the support of others, and never lose sight of their dreams. This could be considered a 'Disappearing Dish' because it's so hard to find. We discovered an elderly lady making this (see picture left) in Banglamphoo area of Bangkok at Wat Pra Kaew during the Chakri holiday. She served it with regular Thai sweet chili sauce rather than the traditional tamarind sauce in our recipe.